I recently purchased an 8” Jointer and cabinet table saw and needed a precision straight edge to properly tune and align my new toys. I have some Woodpeckers products already and am pleased with them (router plates and such)so I had absolutely no reservations about purchasing their product. 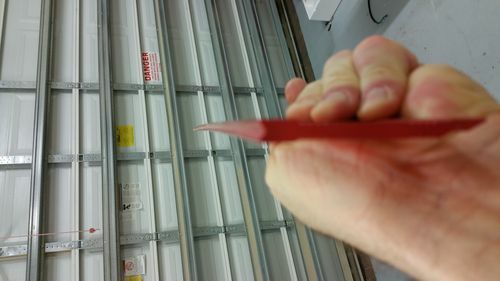 I received my precision straight edge in a really nice particle board case that had a recess in which laid the straight edge, protected from harm. I took it out and was very pleased with the fit and form of the product until I ran me eye down the length of the straight edge. What I saw greatly disappointed me because it looked more like I should mount a string to it and go deer hunting. This thing was totally bowed. I came to the conclusion that it could only have been manufactured this way and not damaged during shipping based on the condition that it arrived in. I was reluctant to exchange it but woodcraft had sent out a replacement before I could ask for a refund so I waited for the new one to arrive. I fully expected the replacement to be void of any defects but as luck would have it , the replacement had the very same defect. I will not bad mouth Woodpeckers as a manufacturer, I own some of their products already and am satisfied. It would seem however that there is certainly an issue with both the quality control and manufacturing process for this item. I’ll be looking elsewhere. That’s pretty narrow for a straight edge… especially one made from AL. We purchased a 36” black anodized AL straight edge with a precision machined flat and contoured top for comfy gripping from Lee Valley at work. It’s dead on and great for tuning up jointers and TS wings, etc… It’s at least a 1/2” thick. extruded AL has to be cooled while held in tension to avoid the metal from acquiring internal strains that manifest themselves as twists or warps. I’d send it all back and check out the LV web site. Matt, I really wish I had seen this product sooner, it looks like a perfect choice for this application. $90 for a 50” straight edge that has a 7/16” base is a steal! Unfortunately I pulled the trigger on a 35” hardened steel straight edge that is ground to a tolerance of .001” but only 1/4” thick. The price was $90 also (shipping included). Thanks for sharing, I will certainly pick up the Lee Valley straight edge if this next one doesn’t pan out. I will continue to share my experience with the new straight edge. I too have the same LV straight edge. Nice. And I have over 10 different products from Woodpeckers, all flawless. But I strongly recommends you contact Woodpeckers to get things fixed. A very possible cause is that the product would not be stored properly at Woodcraft. And the warehouse could not care less about inspecting the goods before shipping. The manufacturer needs to know about this so they can make sure their end-users receive the product they expect. They are a GREAT bunch and do not deserved to be trashed. I have always found Woodpecker’s to be a great company. Any problems and their tech support is right there to help. I own several products including their complete router package. Just high quality and good service. Do call them… they will make it right. I was careful in wording this review and hope no one perceived it as an attack on the manufacturer, I clearly stated I was familiar with their products and quality. I was surprised by the fact that both of these were defective. I may or may not contact them. I saw an amazon review where another customer also had issues with both the first and second straight edge. I don’t have the time to wait, I’m already 2 weeks into waiting for a good straight edge so it’s on to the next…. My guess is that something happened that was out of the manufactures hands (maybe not their control) that affected the edge. I would suspect, that it was mishandled in some way, (possibly temperature) that but a bend in it. I am sure it did not leave the manufacture looking like this. Wow, maybe the whole pallet was stacked oddly and bent the batch? Sorry to hear about this… I have a 12” woodpeckers straight edge, I’ll check if it’s bent when I get home. When I think of quality woodworking equipment, I think of Woodpecker first. I love my router lift and especially my drill press table and fence. But that ruler is bent badly. Something must have happened from the factory on the way to the forum. Thank you for the review. I agree with many others, I too have many Woodpecker products and have never had any issues. I also recommend contacting Woodpeckers directly. I have never had any issues dealing with their customer service, but would like to believe that they would stand behind their products. Looking at it that most likely is a manufacturing issue. They say it is made out of aircraft grade aluminum, I am going to assume it is 6061 which is the most common alloy. Even though 6061 is not a particularly strong alloy, it is too strong to bend like that just by having something sat on top of it. It also would not bend in a perfectly even arc that this seems to be bent into, this is not wood it has to exceed its yield strength to take a permanent bend. If it is heat treated it could have happened then, doubt it happened during the anodization process. I wonder if the only edge claimed to be straight is the other edge, because that can still be straight. Pat, I completely agree that this is a quality issue and not the retailer’s fault. The shipping boxes were pristine as were the wooden cases. Both straight edges had precisely the same bow and in the same direction. A precision tool like this should be flat(to the naked eye at least). As for the product itself I was extremely impressed with the finish and details, but what’s that really worth if it ain’t straight? As for the notion that the bottom could still be flat if the edge were bowed, I just don’t think I could have a whole lot of confidence in that. I can’t imagine that it bows perfectly along any axis without introducing a little twist. Internal stresses are more random and would doubtfully yield symmetrical defects. What I would doubt is the usefulness of a straight edge that was only flat in one dimension. I didn t want to say earlier but I see this is described as machined, but I am pretty sure that it is an extrusion that has had holes drilled in it, are the tick marks and numbers recessed into it? That would be machining, but to call it a machined piece is stretching it if it is mostly an extrusion. I can see an extrusion with such a difference in one dimension than the other coming out with a bow like this. I use an extrusion for a straight edge, a fairly cheap piece of angle. Also I had to chuckle when I saw the words nice and particle board used together, but you are right it does look like a nice case. Disappointing. I have a 24” version and it’s fine. (Your post made me run right out to the shop and check) Guess somebody wasn’t paying attention when they packed yours. Unfortunate.